A 79-year-old Chula Vista woman is in the hospital after being knocked unconscious by a burglar. 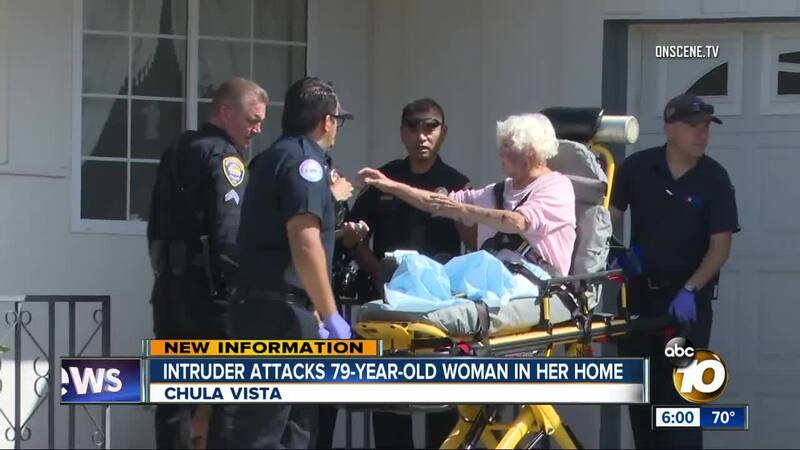 CHULA VISTA, Calif. (KGTV) -- A 79-year-old Chula Vista woman is in the hospital after being knocked unconscious by a burglar. The incident happened around 10 a.m. on the 200 block of L Street. According to police, the woman called 911 after regaining consciousness. She told officers the burglar threw her to the ground when she discovered him inside the home. When she came to, the intruder was gone. Paramedics took the 79-year-old to the hospital for non-life threatening head trauma. The suspect remains at large and is still unidentified. The victim’s only description of the burglar is that he is a man. It wasn't immediately clear whether or not the burglar took anything from the home.